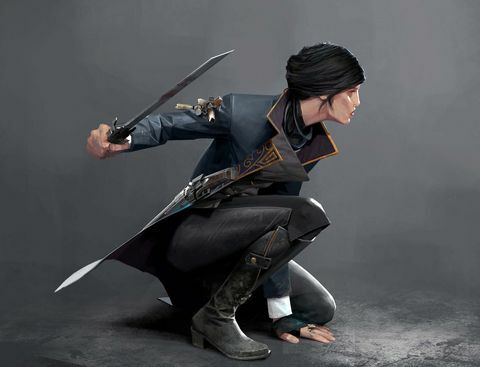 Baz gets a sneak peek at Arkane Studios' supernatural actioner Dishonored 2. As I entered the Clockwork Mansion, my first thought is how familiar it looks. The first Dishonored game in 2012 presented an interesting and tonally defined world, but by the end I had completely had my fill of jumping between Victorian era-esque palaces and slums. 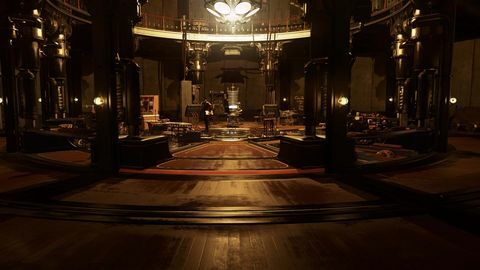 So, upon entering the Clocktower Mansion, a mission roughly four hours into the game, I was a little deflated to find how familiar it all looked. It was with this feeling that I encountered the level's adversary, Kirin Jindosh, and why the following sequences would be so mind blowing. You see, following the classic Dishonored-flavoured repartee with my soon-to-be-victim, the world around me began to shift. The walls buckled and pulled aside and new rooms shuffled past, leaving me quite suddenly in a completely different room in the same space. I was awed, not only because it was a sight to behold, but also because in that moment the game had revealed the new complexities hiding behind its familiar surfaces. My following three hours with the game allowed me to see that this new complexity applies to all aspects of Dishonored 2, from the AI and level design to the delightfully deadly new arsenal of protagonist abilities. I started to explore, discovering that the shifting mechanic is a feature of the entire house, creating a great labyrinth of shifting paths to your goals. Levers are strategically placed around rooms, initiating room shifts that offer new passages for travel, collectibles and story items. However, as the rooms move, it is briefly possible to spy a world behind the walls, and using special powers, it is possible to open up whole new paths of travel by entering these mechanical passages throughout the house. Paths on paths on paths – it quickly becomes apparent that this is the Inception of houses. The sheer number of options felt simultaneously thrilling and daunting, because as I took one direction, I experienced what can only be described as gaming FOMO wondering what lay down the path less taken. Thankfully, my time demoing this mission allowed me multiple playthroughs, letting me approach the mission in numerous ways. The other advantage of these multiple attempts is that it allowed me to inhabit both of Dishonored 2’s playable characters, Emily and Corvo. For those who have played the original game, Corvo remains very familiar. He has many of the same skills – or rather, highly polished and balanced versions of the same skills. Emily, on the other hand, is a whole new beast, and sports a brand new arsenal of skills. Her primary power is Far Reach, which works as the equivalent of Corvo’s Blink teleportation power. However, where Blink flashes Corvo forward, Far Reach allows Emily to be pulled towards a place in space instead. In theory these sound like arbitrary differences, but in practice it opens up whole new challenges and avenues of play. For instance, in my Corvo playthrough I played stealthily, with Blink allowing me to jump from area to area, unseen by enemies. But when attempting the same thing with Emily, I would be spotted as I moved in front of the enemies’ sightlines. Thankfully, I was playing offensively with Emily and this was where her abilities came to shine. Far Reach can be used not only to pull Emily towards a space, but also to pull enemies towards her, leading to some very satisfying kills. But as satisfying as these Far Reach kills are, they are nothing compared to the satisfaction of those achieved using Emily’s Domino skill, which allows you to tie the fate characters to each other. This means that you can tether a whole group of enemies, shoot one in the head with a crossbow bolt, and then watch in morbid revelry as a whole group of enemies’ heads also explode. It should be noted, however, that enemies aren’t the meat puppets that they were in the first game. 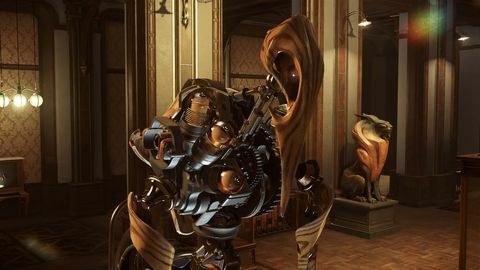 The AI of Dishonored 2 has taken a significant step forward, creating enemies who not only pose substantial combative and strategic challenges, but also make the world more alive in being truer to reality. More than once I was caught by guards I thought I was safe from when they chose to lean over hand rails to get a better look below, or suddenly broke up their patrol pattern. As impressive as all of Dishonored 2’s improvements are individually, it is how they interact that hints at what an incredible game it could be. All elements co-operate to make a consistently challenging and rewarding experience. It is impressive enough that Arkane has created as streamlined an experience as I saw for one play style, but the fact that the studio seems to have managed it for so many different skills and play styles is a real feat. If the whole game is as meticulously crafted and enthralling as this one mission, then Dishonored 2 will not only best its fantastic predecessor, it will be one of the must-play games of this year. ◆ Baz travelled to Sydney to see Dishonored 2 courtesy of Bethesda.